Quartermaster Knives for sale are made in the United States. These knives feature high quality materials at affordable prices. Styles available include tanto shaped blades and framelocks. Buy all types of Quartermaster Knives from their line of tactical tools built for knife enthusiasts. Quartermaster Thomas Magnum Knives are a fixed blade knife that is 10 ¼ inches in all. Made in the USA by Quartermaster, the Thomas Magnum has a 5 inch stonewash finished BD-4P steel reverse tanto style blade. The blade is engraved with the Quartermaster Logo and the USA Made stamp. These full tang knives have a grooved black G10 handle. They have an integrated finger guard and a functional lanyard hole. The Magnum has a transparent Kydex sheath. These knives include a Certificate of Authenticity. Buy the Quartermaster Thomas Magnum Knife for $179.99. Quartermaster Mr. Strickland Knives for sale are 5 ¼ inches when closed. These knives feature a 4 inch CPM 154 stainless steel blade. 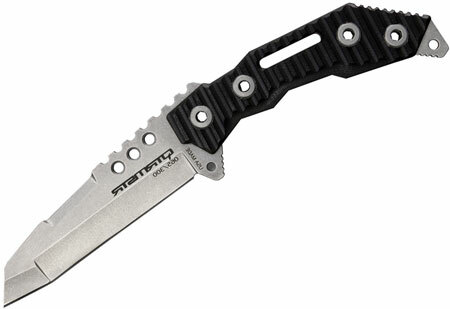 The limo tint black stonewashed finished blade has an airborne tanto blade shape with a thumb disk. These knives feature a chain ring bolt and the ORB pivot system. The Mr. Stickland has a limo tint black stonewashed finish titanium handle. They have a stainless steel pocket clip. These serialized knives also include a certificate of authenticity. Buy the American made Quartermaster Mr. Stickland Knife for $249.99.